With items and loot more or less finished, it’s time to place my sights on the next big feature group. I had originally planned to work on spells and effects in the 0.4 cycle, but also had quests in mind as an equally important feature. So back in July, I used a Twitter poll to sample what the community wanted priority on. The answer came firmly in preference for quests over spells. I need a break from items. If you could vote somehow, which major feature-set would you prefer me to start on next? Fast forward a couple months: 0.3 stable is now tagged on Live Builds page and I’ve started work on the quest system in earnest. This post is the first in a series documenting the journey from raw bytes to a working feature. When adding a big new feature, there’s always a technical planning stage before commencement. I need to understand which of Daggerfall’s binary files are involved in the feature, learn how much is already known about those files (sometimes a lot, sometimes almost nothing), map out the additional details I need to know before I can re-implement that feature, and finally start cutting some code. Sometimes it takes a few iterations, as writing code to pull apart the binaries is itself a journey where new information is learned. I don’t know what I don’t know, and often that new information results in a new iteration with better understanding. There’s basically a research-implement-compare loop going at all times throughout development of Daggerfall Unity. It can be a bit draining. Items for example needed considerable research to bridge the gap between “enough knowledge to make an item editor” and “enough knowledge to fully implement items in a new engine”. Believe me, there’s a huge amount of work needed between having a file spec with lots of unknowns and building a completely functional equivalent. Most of my time is spent somewhere in that gap. Quests are among the most well-understood formats, thanks to the work of several early Daggerfall hackers (notably Donald Tipton and Dave Humphrey). Tools exist to edit live quests, but more importantly decompile the QRC and QBN files to a human-readable source file (thanks to Template v1.11 by Tipton). Early Daggerfall modders already had a good understanding of creating quests for Daggerfall – there’s an established process. Quest files are one of the few cleanly decoupled things in Daggerfall. Unlike items which have template data hard-coded in the executable, quests are nicely self-contained. With the above in mind, it was no longer necessary for me write a quest decompiler from scratch, design a new file format, decouple quest data, or chase half a dozen other time sinks. I can almost go directly to implementation. Almost. But first I need quest data in a usable form. For the first step, I’m using Template v1.11, which you can find on UESP. This tool can decompile all the QRC (quest text) and QBN (quest programming) files to a single easy-to-read text file. So the information goes from raw binary data to the following (snippet from starting quest _BRISIEN). That can still look a bit daunting if you’re not comfortable with programming concepts, but the source format generated by Template v1.11 is generally very easy to read and understand – more like a complex INI file than a real programming language. It’s so good that I’ve decided to adopt Template’s output as the source data for quests in Daggerfall Unity. You won’t need to recompile quest source back to QBN/QRC, rather you will use the source directly in Daggerfall Unity where it will be compiled at runtime by the quest system. This means the de facto standard for creating Daggerfall quests will remain essentially the same in Daggerfall Unity (with some minor differences I’ll discuss later). If you’ve ever created a quest for Daggerfall, or even seriously looked into it, then you already have the skills to create quests in Daggerfall Unity. If you’re new to Daggerfall quests then you can learn from existing quests and read Template’s excellent documentation. Just as I don’t need to start from scratch, neither do you. I will need to change the format slightly for unique needs on my side, but I aim to keep my input format as close as possible to Template’s output format. There’s also the need to emulate support for every single condition and action in Daggerfall Unity to behave similarly to Daggerfall given the same quest source. That will probably be an ongoing process all the way through to 1.0. But we need to start somewhere, and this is a great starting point. The next article in series will look at parsing quest source files and how quests will be executed inside Daggerfall Unity. The latest version of Daggerfall Tools for Unity is now available. 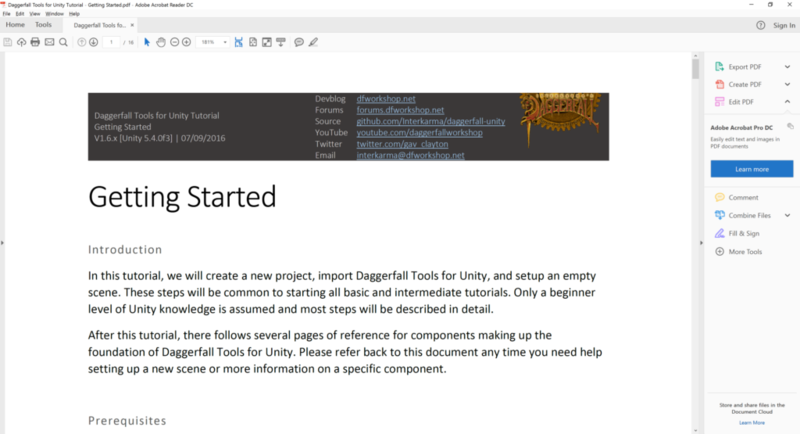 You can either clone the full project from GitHub or download the standalone asset package from the Daggerfall Tools for Unity project page. This version of DFTFU might need to be updated a few times as tutorials are rolled out. The current version is 1.6.1, please grab later version if available. I have also posted the updated Getting Started tutorial to the DFTFU Tutorials page. Image link below will take you straight to tutorial. If you’re interested in developing mods or contributing to Daggerfall Unity, you’ll first need to clone the project from GitHub. This light tutorial goes through the basic process of cloning Daggerfall Unity using GitHub for Desktop and opening with a fresh Unity install. There are many other ways to clone from git, but this is probably the simplest if you’re new to Unity or open source repositories. After cloning the project, I go for a quick run through Privateer’s Hold to check everything is working normally. After launching Live Builds a week ago, I’ve been very happy with the ability to push out small incremental changes. Besides the streamlined build process and less of a wait time, it also means I’m not overwhelmed with bugs every release. I can now tackle large problems fast and keep track of smaller problems for when I have the time. GitHub always has the most recent code for developers. The Live Builds page always has the most recent builds, and links for getting Daggerfall. I will start to tag specific live builds as “Stable”. This means that everything implemented so far is generally working as expected. I will restore the Daggerfall Tools for Unity pages as soon as possible, including updated tutorials. If you were waiting for the convenience of a standalone build, I apologise for changing my plans. Daggerfall Unity is very much a living thing, both in terms of development and community, and can take up a large amount of my personal time. Anything that saves me time I can put back into gameplay, or spend with my family, is extremely valuable to me. The good news is that pointing Daggerfall Unity to your game files has never been easier. The setup helper introduced with version 0.2 makes it very easy to get up and running, and you only need to download the game files once. The first 0.3 stable build will be tagged soon. Lootable monsters just went into the latest live build and is with testers now. I only have the Rest and Keybind UIs to go and I’ve hit all the feature milestones planned for this release. From Twitter user @Highsight, an experiment with Daggerfall Unity and immersive VR. Amazing! Live builds based on latest code are now available to testers, as described in this blog post. Check the forum topic State of 0.3 for information on 0.3 at time of writing. You can download latest builds from the all new Live Builds page. Use the Bug Reports forum to log bugs. Please read the Bug Report Guidelines topic first. The latest stable build is still version 0.2.9 from 09-Apr-16. This version will be updated to 0.3.x in a few weeks once the majority of bugs have been found and eliminated.